Place the tofu on its side (skinny side down) and cut it in half. Then lay the tofu down flat (on its wide side), keeping the layers together, and cut it width wise in half. Cut the halves again in half (width wise). When done you should have 16 pieces. Set aside. In a small mixing bowl, add the orange juice, stock, sugar, ground cumin, ground cinnamon and cayenne. Whisk together until well combined. Set aside. Add one tablespoon of mild tasting olive oil to the large skillet and place over a burner on medium heat. 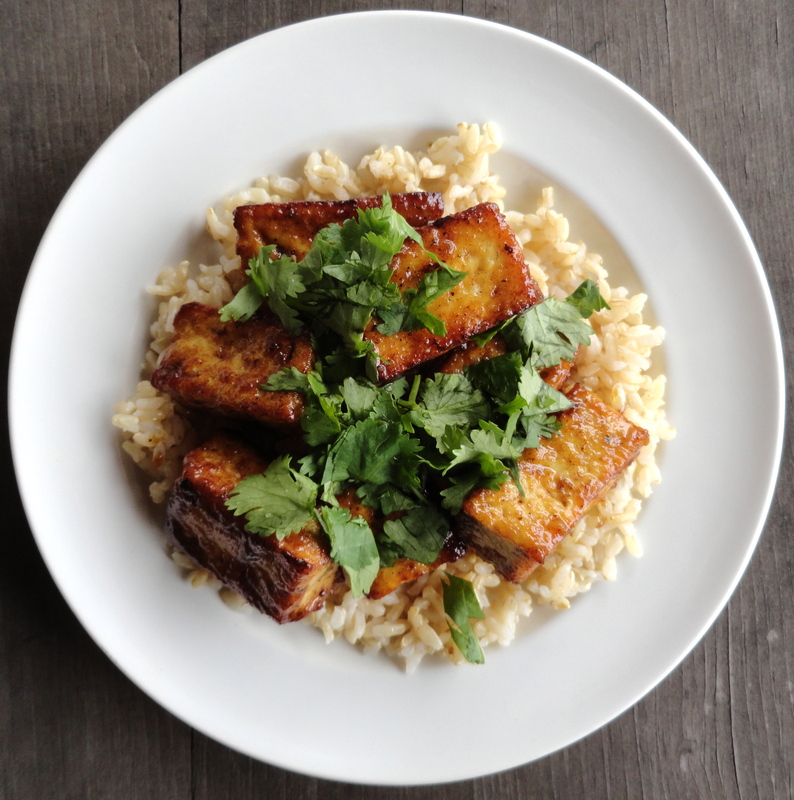 When the oil starts to shimmer, blot the sections of tofu with a piece of paper towel before adding them to the pan. 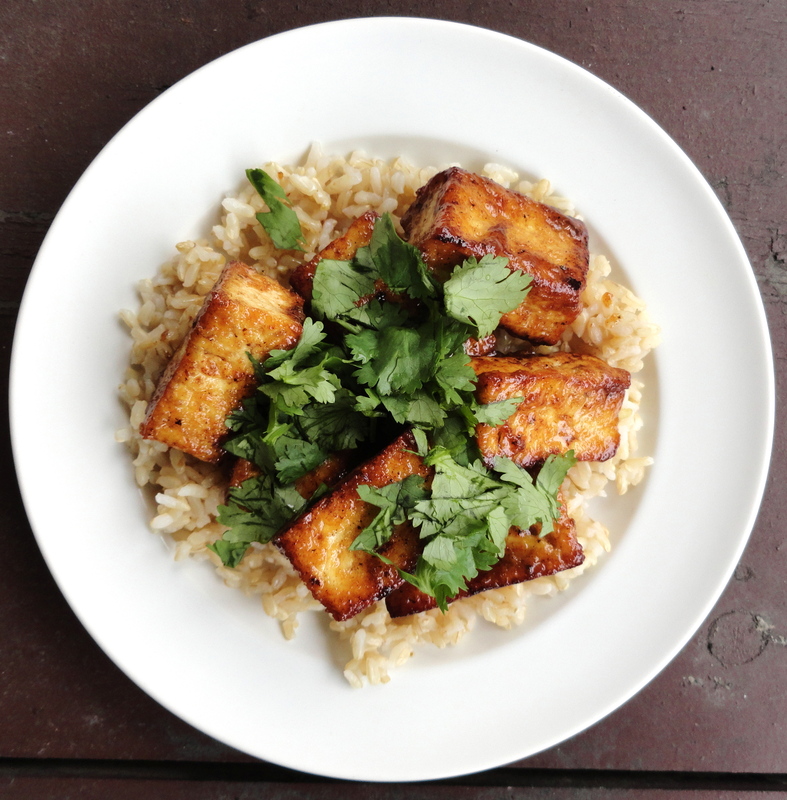 Cook the tofu till golden brown (about six to seven minutes). Then, flip the pieces of tofu over and cook the other side till golden brown (about five minutes). Pour the orange juice mixture into the pan. Allow the sauce to reduce and simmer, stirring occasionally with your spatula, for about two minutes, then flip the tofu over. Continue cooking down the sauce till your desired thickness (I let it go for about another minute). Remove the pan from heat. Serve immediately over rice (don’t forget to scrape out the sauce!) and garnish with cilantro. Thanks so much for the compliment, but it was honestly a lucky shot. nom nom nom (is what I will be saying after making this I’m sure). This is getting added to my recipe list! Oh, yay! I’m so glad you’ll be trying it JLo. Let me know how it goes. I hope you like it! Looks very good! Did you use cassia cinnamon or true Ceylon cinnamon? I’ve written a post about the differences that you might be interested in reading. I buy my spices in bulk from Penzeys and I grab “Penzeys cinnamon,” which is a blend of China cinnamon, Vietnamese cinnamon, Korintje cinnamon and Ceylon cinnamon. So…yes? Haha. When I bought it, I had no idea it was blended. I’m pretty sure I was like, “mmmm cinnamon,” and threw it in my cart. Haha. But I like it (thankfully).